This wiki article is a tutorial from a recent presentation/demo I gave at the Alliance 2010 Down Under Conference in Brisbane. A few things you might notice is that the web service uses currency codes for different currencies and these are defined in the WSDL. For example, AUD for Australia Dollars, NZD for New Zealand Dollars, USD for American Dollars and EUR for Euros. Let's load the web service in soapUI and have a look at what it can do. Leave the rests of the options at their defaults. Double click on the request to load the SOAP editor. This allows you to edit the XML (SOAP envelope and data) that will be sent to the web service. In particular take note of the question marks (?) which is where you need to supply data. Change the From Currency to AUD and the To Currency to USD. This gives you the exchange rate from AUD$1 to USD$1. As you can see at time of writing AUD$1 is worth USD$1.0031. Now that we know how to work with the web service, the next step is to consume the web service from PeopleSoft. 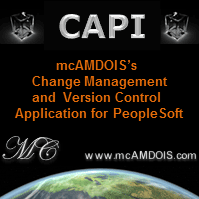 PeopleSoft provides a wizard for consuming web services as part of Integration Broker. Next, review the web service in step 2. You can click on the View WSDL hyperlink to view the WSDL in your browser as we did in the first part of this tutorial. This web service has 4 service ports or variations of the web service. Select the first, CURRENCYCONVETORSOAP service port. Next, you get to choose the service operation. There is only one in this case - ConversionRate. rename them if necessary (note that you have skipped over step 5). The final step is to select the receiver node, which by default will be WSDL_NODE. Make sure you press Finish on this step to consume the web service. Click on the View Consumed Service to open the service and see the IB definitions that have been created. simple pagelet that displays the results of the web service based on user specified parameters. To start the Pagelet Wizard. Add a new value with a Pagelet ID of CURRENCY_CONVERTER. In step 2, specify the data type as Integration Broker. Then fill in the service as CONVERSIONRATE and the receiver node name as WSDL_NODE. enabled by the user, they can also set the From and To currency codes used by the pagelet to display the conversion rate. In step 4, you specify the pagelet format. There is only one option in this case - custom format. In step 5, you specify the pagelet display options which control how the pagelet is presented to the user. Select an XSL template of Table and press the generate button. Also set the opening text to Freeform/HTML and enter the HTML <strong>Conversion Result:</strong>. Requires Personalization check box. Click finish or save to complete the wizard. Select the check box for the currency converter pagelet under PeopleSoft Applications. Press save, and this will take you back to the home page. Scroll down, and you should see the pagelet below your main menu. Customize this pagelet hyperlink. Select your from/to currency codes, and save. Once you return to the home page, you should now see the currency coverter in action.